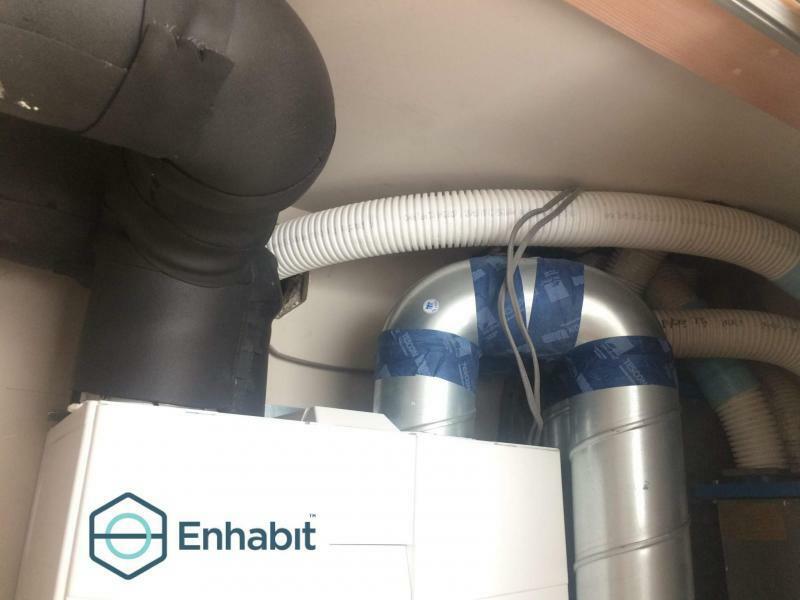 Enhabit were contacted by the client to help fix the poorly-performing MVHR systems in three new-build homes on a single plot of land in Stoke Newington. 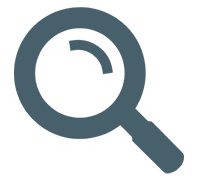 Our initial inspection revealed that problems were due to poor installation combined with inadequate commissioning. These issues had then been compounded by little or no maintenance. 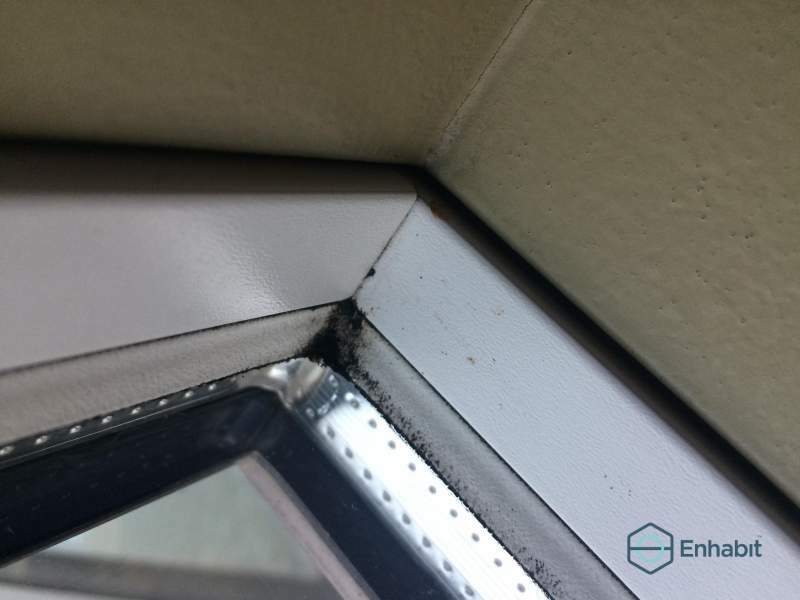 Black mould had appeared at the edges of the windows in one of the properties due to poor ventilation, the MVHR units were noisy at night, and in summer the properties would suffer from stuffy air and regular overheating. The client wanted to minimise building works as much as possible so Enhabit conducted ductwork analysis using a boreometer (a long pipe with a camera and light at the tip) to assess the workmanship of the installation. Flow-rate readings were taken from all of the valves in each room across the properties, and Enhabit was shocked to discover that many of the valves were barely supplying or extracting air from the property, which was leading to excess humidity and poor air quality for the residents. Duct tape had been used on what should have been permanent seals under pressure, so these quickly failed, further adding to the inefficiency of the unit. 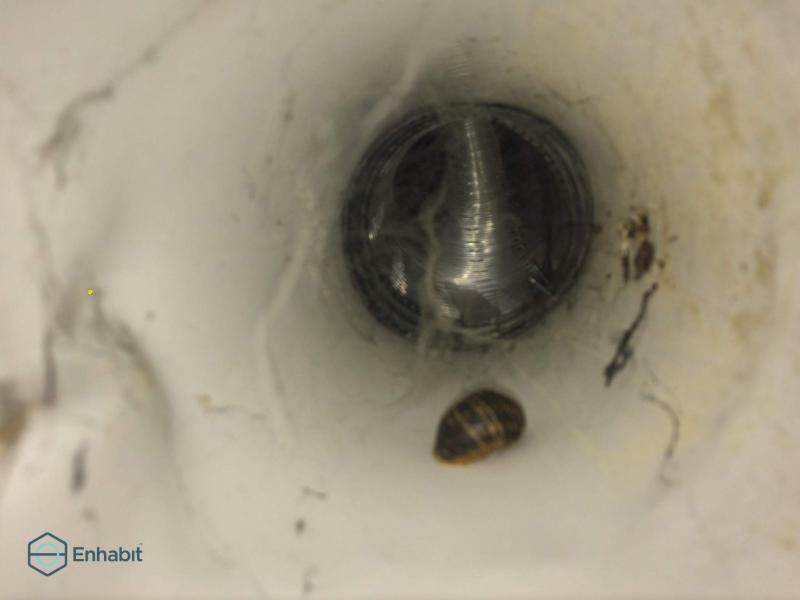 Flexible aluminium ducting had been used throughout, despite best practice guidelines to only ever use it sparingly. It was dented, squashed and, at some points, torn open. This was putting a huge strain on the fans, and helped explain why so few of the valves were actually supplying or extracting air. The ducts carrying air to and from outside were also not wrapped with insulation by the original installer. Because the air within these ducts is cold in winter, condensation was forming on the ducting and dripping down into the kitchen cupboards. Finally, the external grilles had not been property protected and thus were full of dust, dirt and insects, further blocking the system from performing properly. In short, the system was wasting money for the homeowners, providing very poor air quality and causing damage to the building fabric through excessive condensation. 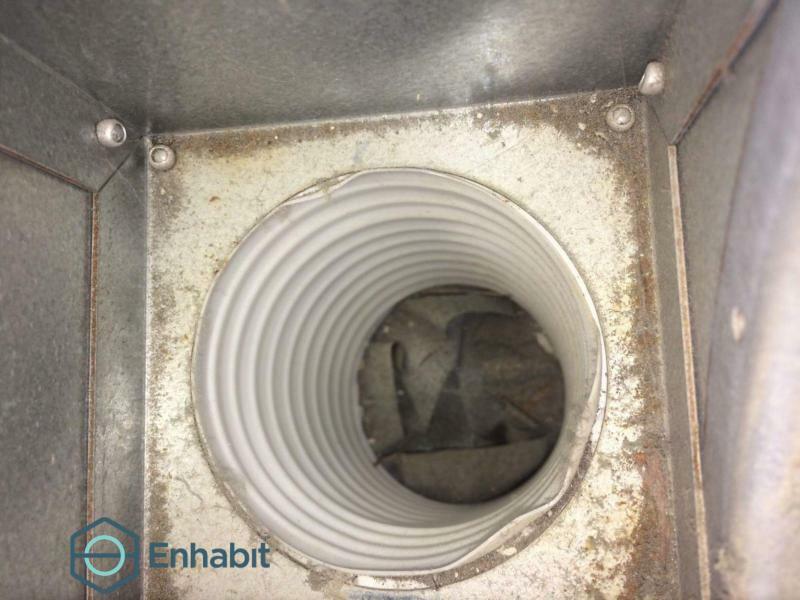 To improve the efficiency of the system Enhabit replaced the poorly-performing flexible aluminium ducting with Lindab SAFE R rigid steel ducting. The units were replaced with a higher-performing Zehnder HR155 MVHR system, which operates more quietly and smoothly than the previous one. The unit also has automatic humidity and summer bypass sensors. If excess humidity is detected the unit will increase the air flow to clear the air. If the unit detects that the house is excessively hot it will dump the warm air straight outside and bring in fresh outdoor air. Enhabit installed new external grilles with weatherproof cowls and insect grilles to help protect the system. Building works by our in-house MVHR installers took three days to complete for all three houses, with the final job being to wrap the external ducts in Armaflex to ensure condensation will not form on the ductwork. Finally, we re-commissioned each of the systems using our own in-house calculations on flow-rates to ensure that each room extracted warm, humid air at the right levels, and provided fresh supply air to living areas. 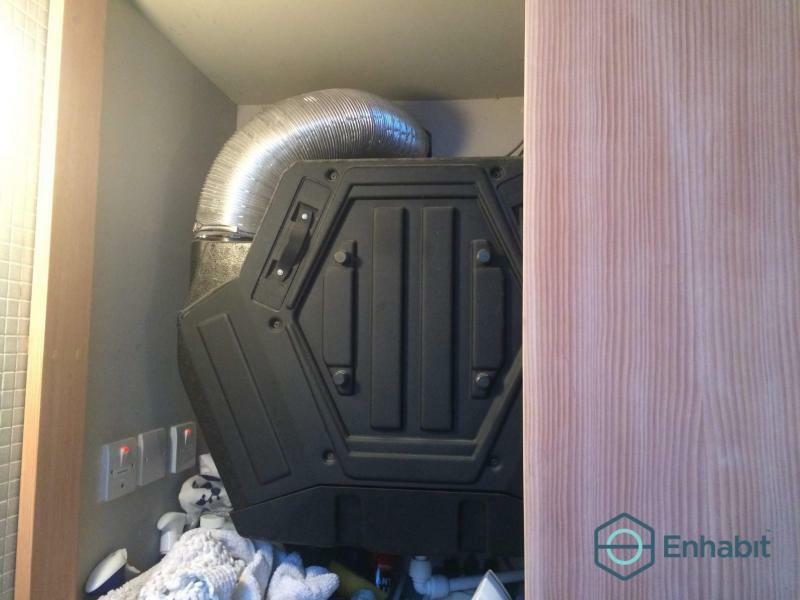 All three units now surpass the requirements for fresh air supply and warm air extraction in each of the properties, and Enhabit will conduct further assessment in the future to see how that impacts on summer overheating and winter fuel bills. Feedback from the occupants so far has been positive, noting that the new MVHR system is quieter, more effective and helping them to cool their homes during the last period of very warm weather in London.